Northfield 5-pc. Counter-Height Dining Set Can’t decide if you need a square or round table? Then get the best of both worlds with this Northfield 5-piece counter-height dining set! This super-stylish set features 4 drop leaves, so the tabletop can go from round to square in seconds. It also features a Lazy Susan, which will make passing the peas so much easier. There’s even built-in storage in the table base! Can’t decide if you need a square or round table? Then get the best of both worlds with this Northfield 5-piece counter-height dining set! This super-stylish set features 4 drop leaves, so the tabletop can go from round to square in seconds. It also features a Lazy Susan, which will make passing the peas so much easier. There’s even built-in storage in the table base! L: 21" x W: 18.5" x H: 41.5"
I like the pub style and high back chairs good for playing games and cards with the lazy-susan. When the table and the chairs arrived every chair wobbled, some to the point where sitting in them would be very annoying. The deliver guy tried to tell me it was my floor and left before I could examine all of them. I also found some imperfections in the table top. I called R&F and they sent out a technician. He corrected the wobbling chairs by loosening all the nuts and the trying to readjust the legs. Where he had to, he put washers on the floor pads and corrected that situation. He found a bigger imperfection in the table with a special light that he carried and ordered a new table top. After the table top was installed, I was moving one chair (have not used the set at all and no one has sat in any of the seats for any length of time) and the seat cushion pulled away from the frame. R&F are sending out yet another tech. My fourth wait since I ordered the furniture. Told R&F that the fix would have to involve screwing all the seats down. If you order this set check it over carefully after delivery. Table is beautiful but seems to not be able to take too much wear and tear. After a couple of weeks the wood chipped on bottom drawer and edges around ridges are lifting. Will need to call for repair or replacements. I would highly recommend this product. It is a great height and very solid. The color of the wood would highlight beautiful wood floors or those with carpeting. It is simple, yet elegant and versatile. The chairs are comfortable and the built in storage on the bottom is excellent for storing small dishes or utensils. There is also room to put a vase or whatever else you choose as a decoration down below.The lazy Susan built into the table top is genius and convenient for handling hot dishes as well as passing dishes without having to carry and move them and when it isn't being used to serve dishes it can also be used to place something decorative. It can easily be converted to at least three different shapes or sizes which makes it so unique. I absolutely love it!!!! I purchased this item three years ago. It is my favorite piece in my home. I love the lazy Susan set into the table, and I keep my cookbooks in the storage drawer below. After three years, it still looks as perfect as the day I purchased and received it! Thank you Raymour & Flanigan!! 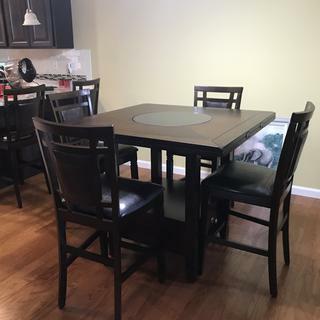 "We" bought this dining room set for our daughter as she just purchased a house. She picked it out and we paid for it...(you know how that goes). Raymour & Flanigan showed up early, were very courteous, set everything up and took away all of the cardboard & wrapping materials.The dining room set looks great and fits perfect in the room! When picking out the set in the store, we were happy with the quality of the wood and the finish. We also liked how the round sides fold down of which our daughter leaves two down and the other two are left up which looks awesome in the dining room it`s in! We have not had any problems with the chairs/table "wobbling" or any problems with the seat cushions. In conclusion...very happy with product and we`ll back in the future to buy more furniture. We had gone to other furniture stores and the quality wasn`t there. This product is extremely well made and very versitile. As other reviewers have said, it is esentially 3 tables in 1. The storage drawer in the bottom allows room to store placemats or table covers. Also, the middle spins and is made of a granite-type material so is safe for hot plates. Great buy, you won't be disappointed! surprised how the height of the table and chairs overwhelmed the space. I have waited a week before writing this review so I could live with the furniture. It is a beautiful set and I adore the lazy susan! I would just like to say that perhaps the salesperson should ask the buyer about their space when they discuss their furniture needs. This dining set would look better in a larger area. If had the chance to do so, I would need to choose a more traditional regular height set. We bought the set in August and by November the table developed bubbles all over the table. The crevices are terrible and we are constantly having to use a air gun to clean out the food. To make matters worse since this is a known problem they are willing to let me rebuy a new table. The kicker is that will not refund me for the chairs, only the table. I will never buy from Raymour and Flanigan again. End result is I am having them replace the table and when it happens again I will have them replace it once again, and again. Not a great way of servicing the client. I was a little hesitant with the dark color of wood, but with all black appliances in my kitchen, this looks great. Very comfortable and classy looking. Great Buy! Looks smaller in the store but is the perfect size for our dining room. Lazy Susan is a good feature so you can put something hot down without ruining the table. The 4 sides are also a good feature since you only have to put up the ones you need to save space. Great looking piece! It is larger than I first thought but the leaf on each side is great for adjusting to my liking. The chairs are high and comfortable. Overall, this is an elegant set that looks great in my kitchen. Time will tell how durable ii is. I love the table set. Nice finished. Very comfortable. The delivery was nice and very professional. This is the perfect kitchen table that expands when you have company or grandparents visting! This table is beautiful. We really love the look of it, makes our kitchen look very elegant! Seems to be of good quality. Very good delivery experience! Would recommend. So pleased with this piece. Love the padding on the chairs and the elegant look. It’s great that I can make it bigger if need be! I Love it! Never so pleased with a store!! Fast delivery courteous staff delivery guys were awesome! Love the table !!! I purchased this set about 3 months ago. I love it. I looked at many sets and kept coming back to this one because of the way it looked. I am so glad I purchased it. It looks beautiful and is so easy to clean. I just wipe it with s damp cloth. my new counter stool dining set is beautiful in my dining area and I have received many compliments on it. This is a very beautiful and elegant dining room set which is very functional. The table can be used as a square or round table with ease with the use of the four folding sides which are attached to the set. It converts to either shaped table in a minute. The color of the table and chairs are so rich looking. The chairs are very comfortable and the material is so soft and make a excellent quality. Thank you Raymour and Flanigan! This is our favorite piece of furniture from here. Love the extra leaves that flip open and love the lazy suzanne. It looks great, I love how it makes my dinning room look. Beautiful furniture. Makes you smile every time you look at it. Great value. Color is just right. Courteous, friendly staff. great dining room set all around! great quality. Love this dining set. It is compact but opens up as needed. Love the drawer underneath. Also love the lazy Susan. My husband picked it up and put it together. Had to adjust chairs so they didn't wobble which was not an issue once he got the hang of it. I totally love this set!! The versatility is exciting! A perfect fit for a small to medium space. Great construction quality. Looks very classy and I love the counter height. Love it! This set looked great in the showroom, even better in our home. Delivery and setup was excellent. Nice table! Exactly what we need in our kitchen. The table dpesnt take much space but easily convertable to bigger, which would fit 8 people. Purchased 4 years ago. Lovely high top dining set with tall chairs. Beautiful, classy and space saving. Fits perfectly into my small dining nook and can be converted easily into a larger round table. Was exactly what I was looking for in my new home. I love the style and the height of the set! Looks great in our dining room. I would recommend it. Table with heigh and expandable. We absolutely love our new table and chairs. It is very versatile, we have a small dinning area the square table expands to make a larger round table for extended guests. This set is very elegant love the Lazy-Susan in the middle for serving dishes, and draw in the base is great for linens-place matts. You will love this set. We love our new kitchen nook table! It closes and opens so easily for our needs and matches perfectly. The lazy Susan center is a great feature for entertaining purposes and the shelf underneath with drawers is a perfect accent compared to standard tables. Very elegant and very functional at the same time. Table adjusts in size from square, rectangular and round. The lazy susan is a nice feature. I've had zero problems with this dining set. The chairs are sturdy. The table is solid. I did pick it up myself and pieced it all together alone. Some stuff is rather heavy and the packaging is quite a lot to handle. But due to self assembly, I have no problems with wobbling and I know that everything fits perfectly. We have had this set for about a month now and I absolutely love it. My fiance and I are not skinny people and the chairs are very comfortable and sturdy. I love the drawer and shelf below for putting place mats or decorations :-) The granite lazy susan in the center is also very handy when we have guests over for dinner :-)|Very Very Satisfied!!! This table fits my new apartment perfectly. And everyone who sees it thinks I got it from a much higher store. I’m very satisfied! Wonderful set, great color and the built-in lazy susan is a neat feature. This dining set is stylish, affordable, & very sturdy! I love that it has the option of expanding into a larger round table vs a smaller square one. The storage underneath is an added bonus as well. I’d certainly recommend to anyone! On top of that, it was easy to self-assemble! how many can it fit comfortably? BEST ANSWER: The Northfield 5-pc. Counter-Height Dining Set will comfortably seat 4-6. How to put back the wood pieces underneath that hold the leaves open? Two came off and don't know how to snap back in place. BEST ANSWER: For assistance with this, please contact our Customer Care team at 866-383-4484 option 2. 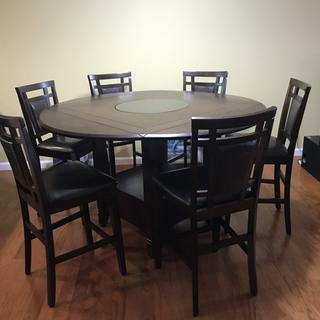 Does this dining set come in regular height? BEST ANSWER: The Northfield Dining Set is available in counter height only. Can you still get this table and chair set at the lower price that was listed last week? BEST ANSWER: We would be happy to assist you in pricing at 866-383-4484, option 2.
is this table available in a smaller size? BEST ANSWER: The Northfield 5-pc. Counter Height Dining set is only available as shown online. If you have any further questions please contact the online sales department at 866-383-4484 option 3. If there any type of protective coverage that can be purchase for the table, to prevent them from scratches? BEST ANSWER: We offer our in home Platinum Protection Plan to cover the table against accidental damage. This coverage will offer service or replacement on many types of damage. Please view the details of the coverage here. http://www.raymourflanigan.com/Platinum-Protection-Plan.aspx Also, we do have table pads that can be ordered as an extra layer of coverage to protect the table top. Is the wood finished to be safe to set a drink on, or do we need to use coasters to prevent spots? BEST ANSWER: The Northfield is made with cheery veneers for a strong durable foundation, you should be fine to set drinks directly on the table. You are always welcome to use coasters! What should you clean this table with? BEST ANSWER: For cleaning the Northfield 5-pc dining set, Dust with a soft, dry cloth.Wipe with a damp cloth.Dry thoroughly with a clean, dry cloth. All spills should be cleaned up immediately. Can I buy replacement chair cushions after expired warranty? BEST ANSWER: For warranty assistance, please contact Customer Care at 866-383-4484, option 32. Can I get this Northfield 5 pc set without the lazy susan, just an all wood top? BEST ANSWER: The Northfiled Dining Table is available with the lazy susan option included only. Can I order extra chairs? And how much weight can a chair hold? Can you raise only two (opposite sides) of the leaves to give it an oval effect? BEST ANSWER: Yes, you are able to raise just two leaves at a time for the Northfield Dining table. Does the lazy susan come out for cleaning purposes? Is the faux leather brown?|Also, I noticed in another question/answer below that it was stated that the leafs just drop down and do not attach up under the table. If this is true, are the leafs not in the way of the person sitting there? BEST ANSWER: The faux leather on the Northfield Counter Stools are brown. The leafs on the table will not be in the way of the person sitting in front of it. Does Raymour and Flanagan sell any sort of protective cap/cover that can go on the end of the chair legs? Do the table leaves fold under the table when you don't want to use them? BEST ANSWER: This table features drop leaves. The leaves do not fold back under the table, but they do drop down when not in use. Does the leaves on the table fold under the table and store? i saw one in a competitor's store that does. This looks similar, but with a darker stain, which I like a little better. Thanks. BEST ANSWER: This table has drop leaves. They fold down to change the size and shape of the table. Do the folding leaves snap/attach under the table when not in use? BEST ANSWER: The leaves are not self storing, so they would need to be kept elsewhere. Is this a Solid wood? what type of wood? BEST ANSWER: This dining set is carefully crafted of hardwood solids and cherry veneers. Hi, Is this set 1 piece or is assembly required? BEST ANSWER: The stools do come fully assembled. The table is two pieces, the top and base. Assembly will be handled by the delivery team as part of our delivery service. Do the stools/chairs have something on the bottom of the legs to protect the Dining room floor - such as rubber or felt? BEST ANSWER: There is no rubber or felt on the bottom of the stools. Does this set come in any other finishes? What would the shipping cost be to area 85118 for this set plus two additional chairs? Thanks! BEST ANSWER: This set does not come in any other finishes. To inquire about pricing and shipping, please call 866-383-4484 option 3.